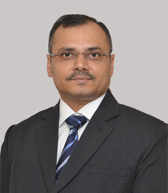 Sanjeev Kumar Mishra is a Partner in TR Upadhya & Co with more 17 years of experience in conducting internal audit and risk advisory, external statutory audits and compliance reviews. His experiences in working with both national and international clients has been invaluable to the firm. His extensive knowledge in various sectors including hydropower, banking and finance and telecommunication has been instrumental to those who have trained under him.